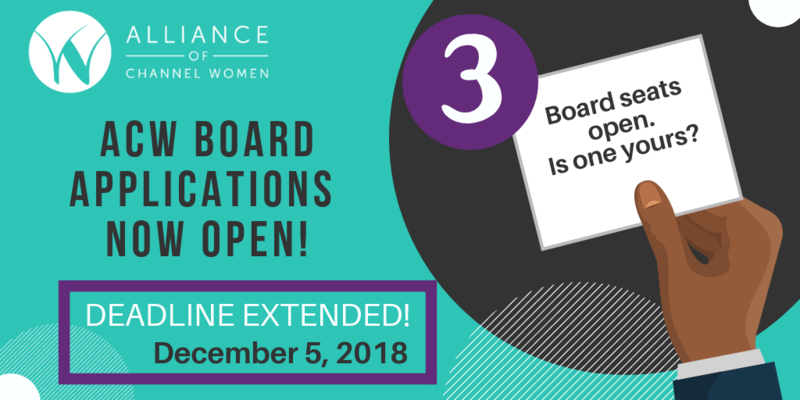 Alliance of Channel Women is looking for female channel leaders to join its board of directors for the next two years, beginning in January 2019. This is a great opportunity to influence the direction of our organization, to innovate with programs that will empower women in their tech channel careers and to invest in building your leadership skills while positively impacting your channel community. Complete the Board Application and sign the Board Responsibilities in the form below. Secure a letter of professional recommendation. Complete the application below, and email recommendation letter to billing@allianceofchannelwomen.org no later than December 5, 2018. The Alliance of Channel Women Board of Directors will review all applications and final candidates will be voted upon by the ACW membership body. Selected candidates will be notified in December 2018. Thank you for your interest and support of Alliance of Channel Women. Candidate must be a current member of Alliance of Channel Women and in good standing. Candidate must be willing to serve on the Alliance of Channel Women Board for two (2) years. Candidate must currently hold a revenue-generating and/or leadership/ownership role either within the telecom/IT channel or directly serving the telecom/IT channel. A current affiliation with a Alliance of Channel Women Committee and holding a leadership role (e.g., Chair, Co-Chair, Liaison) is preferred but not required. Eligible candidates are invited to nominate themselves, or they can be nominated by any existing Alliance of Channel Women member. Candidates must complete and submit the Application within the stated timeline. They also must acknowledge via signature having reviewed this Alliance of Channel Women Board Responsibilities document. Alliance of Channel Women Board Members will review each Application for completeness. Alliance of Channel Women Board Members will vote on the candidates. New Alliance of Channel WomenBoard Members will start their term January of the following year. Alliance of Channel Women Board Members must uphold the vision and mission of Alliance of Channel Women. Alliance of Channel WomenBoard Members must lead or act as the Board liaison for a minimum of one (1) Alliance of Channel Women Committee and attend conference calls as needed for the committee’s success. Alliance of Channel Women Board Members must write blogs for the Alliance of Channel Women website and/or contribute to the Alliance of Channel Women newsletter. Alliance of Channel Women Board Members must attend Alliance of Channel Women Board meetings and participate in planning discussions and decision-making. Note: Two Board meetings per year take place prior to Alliance of Channel Women events held at the Channel Partners conferences. Alliance of Channel Women Board Members must attend at least one (1) Board meeting in person. All other Board calls are held once per month for 90 minutes via conference call. Alliance of Channel Women Board Members must attend one (1) Alliance of Channel Women live event per year. Alliance of Channel Women Board Members must sponsor a new member. Alliance of Channel Women Board Members must represent the group in accordance with its bylaws and core principles. Alliance of Channel Women Board Members must support other Alliance of Channel Women Board Members and Committee Chairs to meet their objectives. When rotating out of their terms, Alliance of Channel Women Board Members must pass on experience via at least two (2) conversations, a written overview of their commitments and experience on the Alliance of Channel Women Board, and be available to answer questions or assist as needed.